Inhibits calcium from entering myocardial and vascular smooth-muscle cells, thereby depressing myocardial and smooth-muscle contraction and decreasing impulse formation and conduction velocity. As a result, systolic and diastolic pressures decrease. Adults: 30 to 90 mg P.O. three to four times daily (tablets), or 60 to 120 mg P.O. b.i.d. (sustained-release), or 180 to 240 mg P.O. once daily (extended-release), adjusted after 14 days as needed, up to a total daily dosage of 360 mg. Or 0.25 mg/kg by I.V. bolus over 2 minutes; if response is inadequate after 15 minutes, may give 0.35 mg/kg over 2 minutes; may follow with continuous I.V. infusion at 10 mg/hour (at a range of 5 to 15 mg/hour) for up to 24 hours. • When giving I.V., dilute in dextrose 5% in water or normal saline solution. • Give I.V. 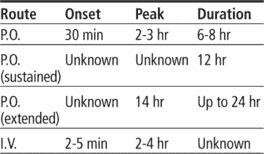 bolus dose over 2 minutes; a second bolus may be given after 15 minutes. • Administer continuous I.V. infusion at a rate of 5 to 15 mg/hour. ☞ When giving by continuous I.V. infusion, make sure emergency equipment is available and that patient has continuous ECG monitoring with frequent blood pressure monitoring. • Don't crush tablets or sustained-release capsules; they must be swallowed whole. • Withhold dose if systolic blood pressure falls below 90 mm Hg, diastolic pressure is below 60 mm Hg, or apical pulse is slower than 60 beats/minute. • Check blood pressure and ECG before starting therapy, and monitor closely during dosage adjustment period. Withhold dose if systolic pressure is below 90 mm Hg. ☞ Monitor for signs and symptoms of heart failure and worsening arrhythmias. • Supervise patient during ambulation. • Instruct patient to swallow extended-release capsules whole and not to crush or chew them. • Advise patient to change position slowly to minimize light-headedness and dizziness. A trade name for DILTIAZEM.